Nina is nicknamed “The Eyebrow Queen” due to her obsession with changing and improving people’s eyebrows! Nina can create the current must-have highly defined brows look* using a combination of tinting, trimming, waxing, reshaping and plucking to create the perfect PowerBrow for you. Eyebrow tinting changes the colour of your eyebrows, adds the illusion of thickness and dimension and may be the closest thing to permanent make-up for the brows. Having more defined eyebrows can literally transform your whole look and enhance the best features on one’s face. With eyebrow shaping you take your appearance to a new level of beauty. A well-groomed brow line creates the subtle difference that will affect your overall look. Please Note: Clients must undergo a patch test before any tint treatments! 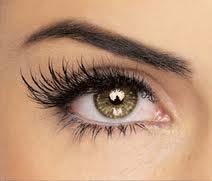 Tint shades and eyebrow treatments are discussed with client so that we can give the client the look they require. After-care advice always given. * Nina does not offer the branded HD Brows treatment, the term has been used here as it has become the buzzword for the well-defined eyebrow look. Nina has no affiliation with the HD Brows brand and in no way suggests that she will be offering their products. HD Brows is a brandname owned by High Definition Brows Limited.